The house is cosy, and perfect for two with a galleried bedroom, although there is a further single bedroom too reached via the main bedroom. There is a log fire, terracotta tiled floors, and beamed ceilings throughout. There is also a sofabed. WIFI . Possibility to hire SKY package at E25 per week - movies, sports, children's etc. If required, please order on booking to secure. (Please note due to Sky regulations, the SKY package offered is the Italian Sky but the language to sports and movies and many programmes can be changed to English using the remote control). We really enjoyed the 4 days spent in the restored mill. The location is approximately 1.5hrs north of Pisa and 1hr away from Lucca, both can easily reached via road or a train that can be caught nearby. There are plenty of cafes and restaurants to eat in the nearby town and a supermarket. The property caters very well for its visitors and the owner has clearly put a lot of thought into what is required for its guests, including cooking utensils, condiments, towels, you just literally have to turn up with your clothes and a tooth brush. I would highly recommend this villa, although to use of a car to reach it is essential, but you shall get to see parts of Italy others do not see. Thank you for your review - always good to know that guests have enjoyed this unique property and location! We hope to hear from you another time. Romantic ,charming getaway set in the Tuscany hillside, we stayed here for two weeks and loved every second, there is plenty to do and see around the area but you really won't want to leave this charming mill and its beautiful gardens. we have used owners direct for many years and this is one of the best equipped properties we've stayed in. The owners are so warm and welcoming and can't do enough to help you enjoy your stay, can't wait to go back. Der Vermieter war unglaublich zuvorkommen, hilfsbereit und freundlich und hat somit auch dazu beigetragen das wir einen herrlichen Urlaub in der Toskana verbracht haben. Thank you for your review - we are glad you found this place to be well maintained and magical! Our stay at Al Mulin del Isola was perfect! We liked the location very much. A big nice maintained garden with a great pool, a little river nearby. Very quiet, even a dear passed by! The house was also great! A nice well equipped kitchen, a cosy living room, a very large bedroom with great beds, a clean and convinient bathroom with a shower. Our daughter slept in the open room you have to pass when you to to the bathroom. It was okay for us but it would be even be more perfect for her to hang a curtain overtreden to avoid the light when someone passed by. When we arrived there was a great welcome with some first needs, a nice bottle of wine, flowers at the tables, everything was been thougt of. That mades us feel special. Service was absolutely great! We hope to come again and enjoy an other stay at Il Mulin. Thank you for your review and fantastic to hear you had a wonderful stay and loved the house, garden and river as well as the welcome touches provided by the owner. We will pass on your suggestion re an internal curtain for when you pass to the bathroom. The large bedroom you mention is being refurbished for 2017 with lighter furniture and possibly a 4 poster bed so will be even nicer than now , and there will also be a new sofa to update the living room a little so the house will be even better if you do return as suggested. Fabio and Elisa would love to see you again. 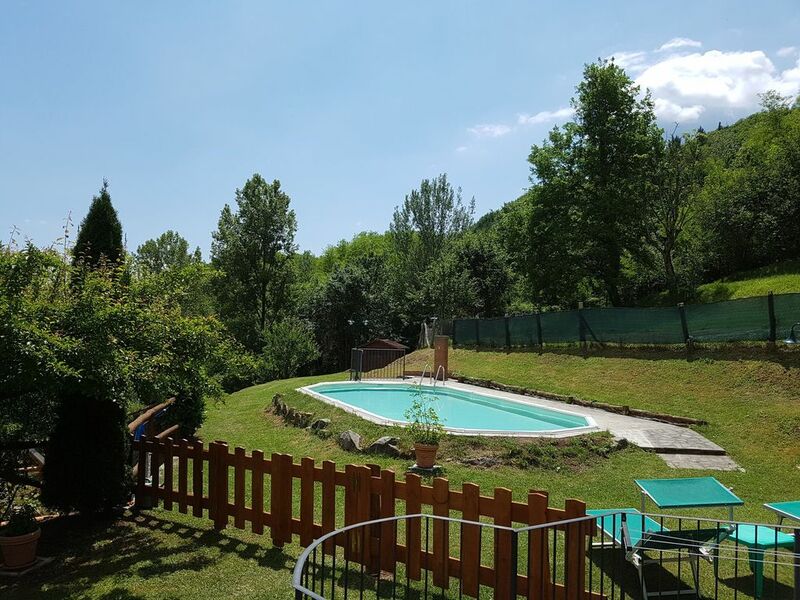 Filicaia is situated just 4 km from the market town of Castelnuovo which is circa 40 minutes north of Lucca in the beautiful, unspoilt green and mountainous part of Northern Tuscany known as Garfagnana. Circa 1 hour from Pisa, and 2 hr. 20 min. from Genoa.